His refusal to speak silenced the bazaar. The noise of commerce died. Only whispers fluttered from stall to stall, tent to tent, beggar to beggar, wondering what could have happened. The hammers of smiths lay idle, the calls of hawkers dwindled to murmurs, and even the street preachers stopped their sermons as everyone crowded to see. The storyteller had appeared years before, nothing more than another grime-smeared vagrant drifting into the capital. He brushed the dust from a little corner of the main square and sat cross-legged, back stiff with a dignity not often seen in street dwellers. No one paid him any heed until he began to speak. Since that day, a throng always attended him. They waited every morning for him to assume his customary place. They didn’t disperse until the afternoon when, gathering the coins they’d tossed at his feet, he took his leave. When he told his stories, street urchins rubbed shoulders with aristocrats, leaning in to catch every word. Every story was different. He coaxed tears from his audience with love lost. He roused them with adventure in faraway places. He amazed them with magic and wonder. In days, the entire city knew of the storyteller. Within a year, his fame spread throughout the empire. The market, previously known as “The Grand Bazaar,” became “The Bazaar of the Storyteller.” He was counted among the empire’s greatest treasures. Kings and caliphs traveled to hear him. Today the new emperor had come, yet the storyteller did not speak. In the emperor’s palanquin, the only noise was the buzzing of flies, until an attendant chased them away. Slaves waved ostrich-plumed fans, moving the hot air in pointless circles. Behind the palanquin, a row of dignitaries muttered into their beards and wiped the sweat dripping from under their turbans. 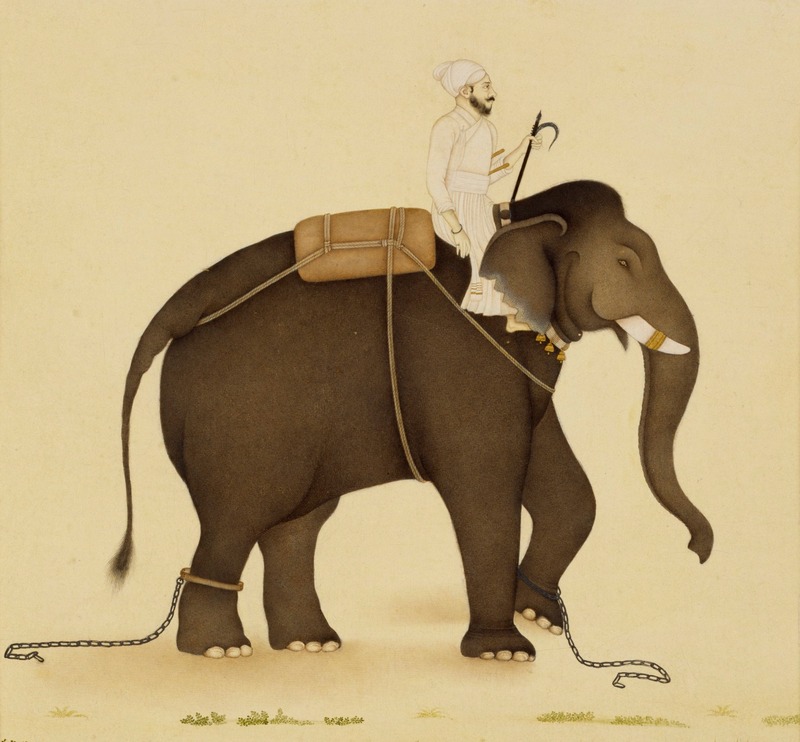 The imperial elephants, festooned with sequins, shifted their weight from foot to foot. One relieved itself, but when the noise of the steaming pile plopping to the earth died away, the uneasy silence settled back onto the bazaar, heavier than the heat. The emperor summoned his grand vizier. “Do something,” he commanded. The old man bowed, long beard brushing the ground. He stepped forward, facing the silent storyteller. The morning before, the vizier had dispatched a messenger to summon the storyteller to the alabaster palace on the hill overlooking the city. The messenger returned empty-handed. The storyteller would not come until he was done telling stories for the day. The vizier seethed at the impudence, but resisted the urge to order guards to drag the storyteller to him. The emperor valued genius and artistry more than his vizier thought advisable. Reluctantly, the vizier indulged the delay. The storyteller appeared that evening, as dusk breezes blew away the day’s heat. He knelt before the imperial throne, forehead to the ground in a proper show of deference. At the emperor’s right hand, the vizier told him to rise. “Since His Majesty has lately ascended to the throne of his father …” he began, pausing to let the storyteller show his reverence for the late emperor. “Peace be upon such a great man,” the storyteller said. There was a silence. Every courtier’s eyes stayed on the storyteller, who did not respond. Clearly, he didn’t realize the emperor expected an answer. The vizier prompted him by clearing his throat. The court held its breath. It was unheard of for the emperor to speak for himself to a commoner. Before the vizier could speak, the storyteller answered. “Your Majesty could send scribes to the bazaar to write them down as I tell them,” he said, as casually as a man haggling over the cost of a plate of rice. A broad smile spread across the emperor’s face. The storyteller threw back his head and laughed. Every courtier in the room stiffened at such impudence. “That is impossible,” he said. The emperor was no longer smiling. The storyteller, apparently oblivious to the danger he was in, shrugged his bony shoulders. “There is nothing I can do,” he said. Guards hustled the storyteller out of the court. The storyteller sat quietly on the ground. The eyes of the multitude settled upon the grand vizier. The storyteller did not respond. The storyteller’s mouth stayed closed. “He must have been,” a voice called from the crowd. The crowd gasped with shock. “Someone he loved died last night,” called a blacksmith from behind his anvil. “Probably his son. There is no worse sadness.” He sighed and leaned on his anvil, eyes cast to the ground. “No, it is a woman,” a traveler said. “The woman he loves has been married to another.” He glanced out the open city gate, down the caravan road, into the distance. The vizier called for order, but he was too late. Emboldened, the crowd shouted out their own ideas from all around the square. The shouts crashed into the vizier’s ears, first one at a time, then layered on top of one another until they could not be distinguished amid the general clamor. He raised his hand. The crowd did not notice. “Silence!” he shouted. The shouting faded to murmuring, then whispering, then silence. From within the imperial palanquin, a laugh interrupted the quiet. The crowd fell to its knees as the emperor emerged. The emperor bowed to him. He dismissed the vizier and the rest of his retinue back to the palace. Then he took a seat amid the crowd, and listened as the storyteller began a new tale. Gary, I really enjoyed this tale, and your performance (“reading” is too half-hearted a word) at Floriopolis. Glad to have made your acquaintance as well. This is a charming story that reminds me a great deal of the Arabian Nights tales. Well done, Mr. Dearman! Very well done. Gary, I really enjoyed your story! Vivid descriptions! You rock! I hope to see you read it one day. Still such a great story–it improves every time I look at it again.